I have a habit of going on shopping spree to get items for the recipes I might have came across and want to try it zealously, which sometimes increases my stock pile in the pantry. During one of those shopping trip I noticed the 'Whole Wheat Orzo' on the pasta aisle. I couldn't resist picking it up and adding to the things I already got on my cart. 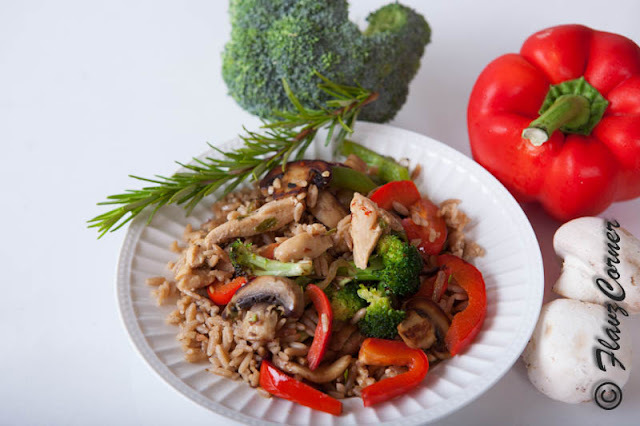 I wanted to make something tasty and healthy that is perceptible by kids and came up with this idea of 'Orzo with Lemon Herb Chicken and Vegetables'. Beginning of summer I decided to plant some herbs like Rosemary, Oregano and Basil in a container. I prefer the fresh herbs in my pasta dishes rather than the dried ones. 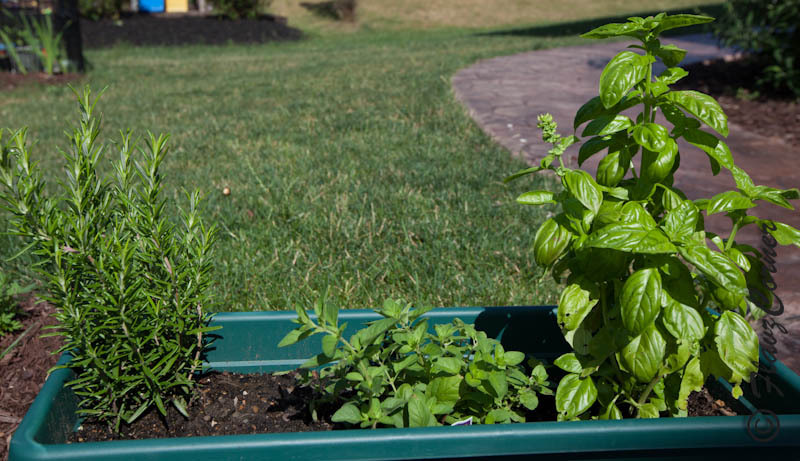 Planting them in a container was a wise decision I made, as I could bring them inside during winter and still enjoy the fresh herbs during snowy days. Running to the patio and snipping some herbs not only thrills me but also gives me the satisfaction of what is going into the dish. The fresh herbs along with lemon zest gives a pleasant aroma to this dish. This a perfect dinner that balances carb, protein and fiber without the fatty sauces you get from the store. To save the time of entire cooking, you can cook Pasta and chicken simultaneously and start cutting the vegetables when they are cooking. Cook Orzo according to the package direction in water or chicken broth. In a non stick pan add the olive oil, chopped garlic and cook till it is lightly browned. Add the chicken, herbs, pepper, salt, lemon juice and pepper flakes and cook covered till the chicken is no longer pink. Add the lemon zest to it and cook for another minute and remove from heat. Mix the cooked left over juice from the chicken with orzo and keep it aside. In another non-stick pan add the olive oil and cook the garlic till it is lightly browned. Add the onions, salt and pepper and cover and cook on medium heat to high heat for couple of minutes, followed by mushroom and cook for another 2 minutes till the mushroom starts to lightly caramelize. Cook rest of the vegetables covered for 2-3 minutes. Add the lemon zest and cook for 2 minutes and remove from heat. Mix the orzo, chicken and vegetables together and garnish with chopped Basil and Parmesan cheese. You can skip the chicken if you are preferring a complete vegetarian meal. Use mushroom instead of chicken and season with lemon and herbs. Try to use the fresh herbs which enhances the flavor. Lightly browning the garlic in extra virgin olive oil enhances the flavor of the pasta dishes. Use medium to high flame and non-stick pan or a cast iron pan to cook vegetables as it uses less amount of oil and retains the color when cooked fast. Make sure you don't overcook your vegetables as they tend to lose their color and nutrients. Adjust the seasoning and lemon juice according to your palate. 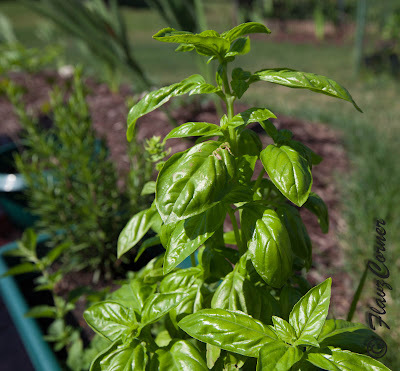 I love fresh herbs..those pic look really good !! Thanks Shema!!! I grew the basil from seeds. They came out really good. BTW I am planning to make the tangy & spicy chicken wings tomorrow for a get together. Totally yum! And I have the exact same shopping habit. Yikes!!! Thanks Kiran for dropping into my space!!!! This means a lot to me. I am a follower of your blog and the photos on your blog are amazing.